Charles Marion Russell (1864–1926) was many things; consummate Westerner, historian, advocate of the Northern Plains Indians, cowboy, writer, outdoorsman, philosopher, environmentalist, conservationist, and not least, artist. In Montana’s Basecamp for Art & Adventure, you can experience first-hand the places Charlie touched; from the Judith Basin where he worked as a ranch hand to his home and studio at the CM Russell Museum Complex. Born in St. Louis, MO, Russell dreamed of becoming a cowboy and living the exciting life of a man on the range. In 1880, Russell came to the Judith Basin of central Montana a few days after his 16th birthday to work as a cowpuncher. 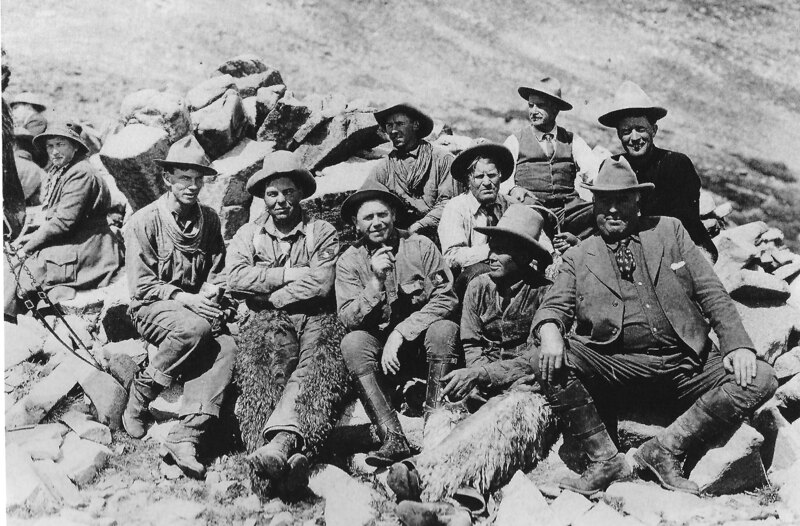 After a brief and unsuccessful stint on a sheep ranch, Jake Hoover, a hunter and trader, took Russell under his wing and taught him the ways of the wilderness. 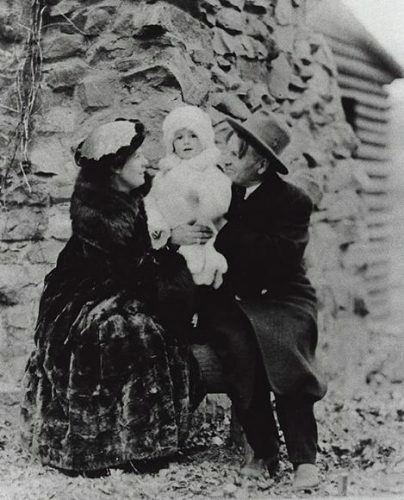 Russell spent two years as Hoover’s apprentice, working with and living in Hoover’s cabin on the South Fork of the Judith River. In 1882, Russell secured a job as a night herder with several cattle outfits operating in the Judith Basin. This was the perfect job for the young artist because it gave him the opportunity to observe, sketch, and document the activities and excitement of the cow camps. One of Russell’s most iconic images came out of his early cowboy days. 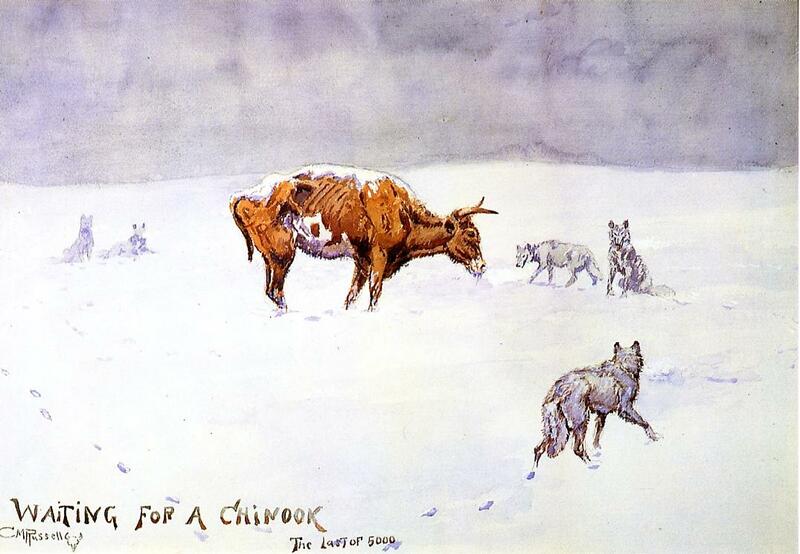 Waiting for a Chinook is Russell’s haunting depiction of the 1886-87 blizzard that swept throughout the region resulting in the deaths of 20-30% of all herds in Montana Territory. He sent the small watercolor to Lewis Kaufman, owner of the Stadler & Kaufman cattle company, rather than a standard telegram because it was believed to be more powerful and effective than words could convey. This work alone was enough to secure Russell’s reputation as the Cowboy Artist. He continued working the open range as a wrangler for 7 more years before retiring in 1893 to become a full-time artist. Russell greatly admired the Northern Plains Indians, closely observing their ways during the summer of 1888, when he lived near the camps of the Blackfeet, Piegan, and Blood Indians in Alberta, Canada. This experience affected him for the rest of his life, and it is reflected in the many detailed works he created of Plains Indian life. In 1896, Russell married Nancy Cooper, and she quickly assumed the role of business manager and promoter of her husband’s career. 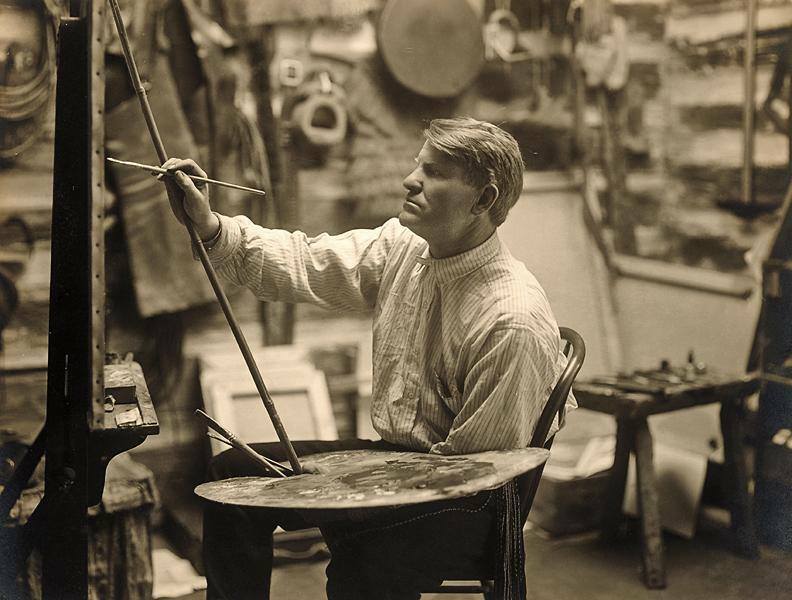 Russell was a prolific artist and he produced 4,000 pieces of art during his lifetime, the majority of which were completed in his Great Falls studio. One of the artist’s crowning achievements was the commission of a major 12×24-foot mural for the State of Montana that has hung in the legislative assembly hall in the state capitol since 1912. 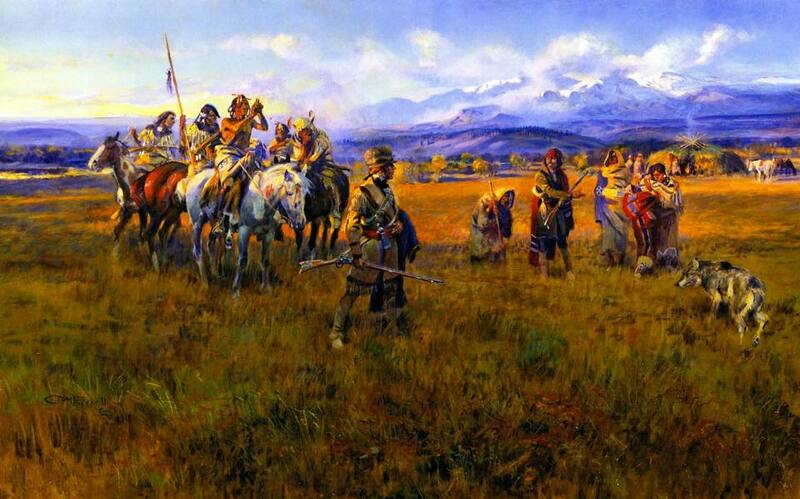 This monumental work depicts Lewis and Clark leading the US Corps of Discovery on their westward journey and rendezvousing with a group of Oollashoot Indians in the Flathead Valley of Montana. To accommodate the size of the canvas in his studio, Russell had to raise the roof by four logs, an architectural change he later regretted. In 1908, Russell was made an honorary lifetime member of the Elks Lodge of Great Falls. 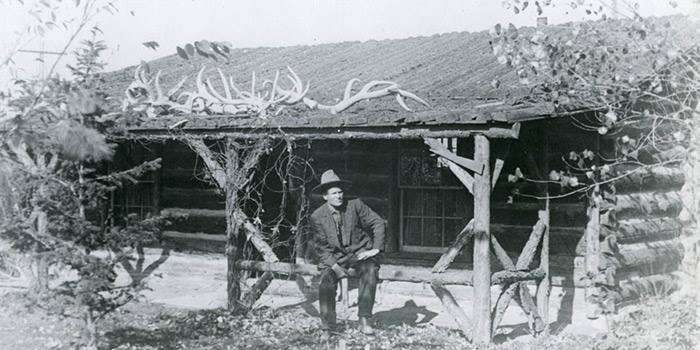 Not long after, the Elks dedicated a new temple and asked Russell if he would contribute something for the building. The result was a painting of a majestic Elk and heard atop a mountain rise and titled The Exalted Ruler. It is considered to be one of Russell’s masterpieces. 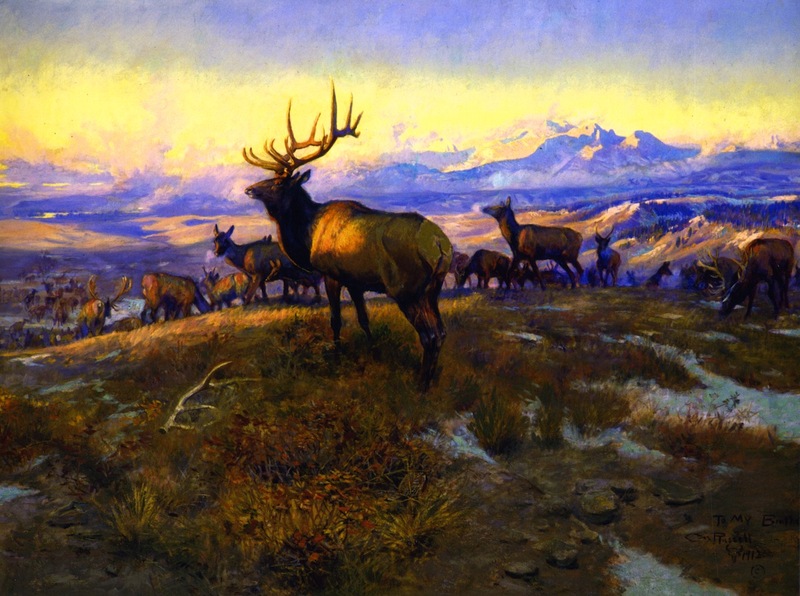 The painting is significant not only as one of Russell’s finest wildlife compositions, but for its importance to the people of Montana. When the Elks Lodge decided to sell the painting in 1994, a statewide fundraising campaign was mounted to raise the money needed for the purchase. Donors contributed $250 per square inch of painting. 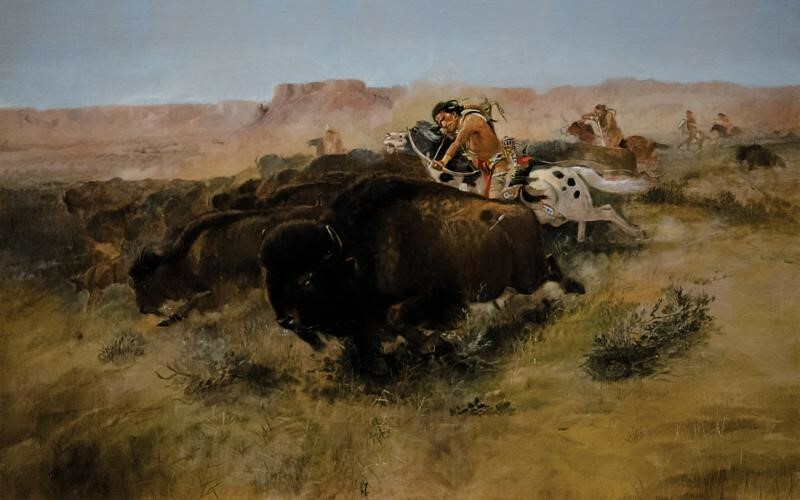 Its success is a testament to the power of grass roots Western spirit and dedication, and the painting is now part of the CM Russell Museum’s collection. On October 24, 1926, Charles M. Russell died of congestive heart failure in his Great Falls home. The entire city turned out for his funeral procession. 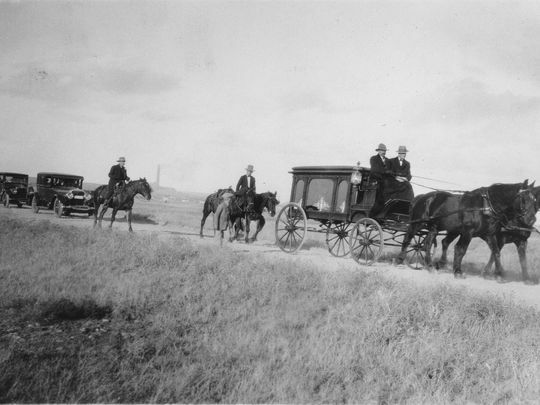 In fact, he was so highly regarded as a resident of Great Falls that all school children in the city were allowed to be absent to watch the procession. Today, Russell’s art hangs in galleries, private collections, and museums around the world. A significant portion of his work can be found in the permanent exhibitions at the CM Russell Museum Complex in Great Falls. The museum and grounds feature Russell’s original log cabin studio and his Great Falls home, listed together as a National Historic Landmark (NHL). 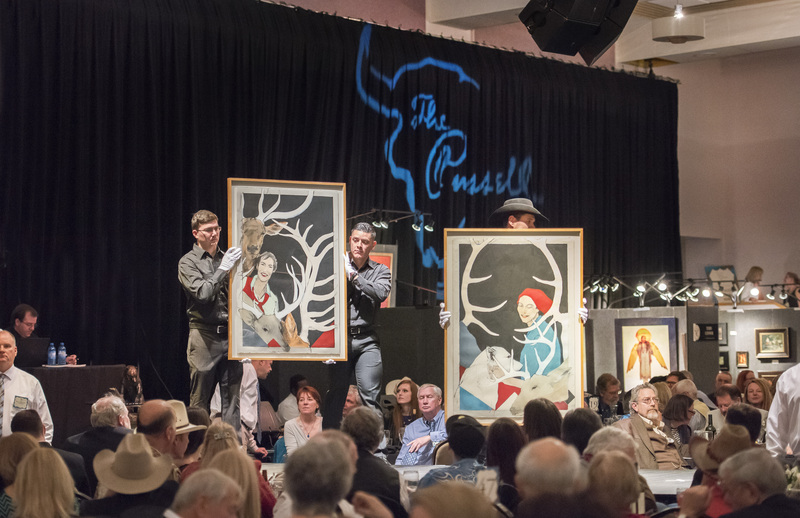 Every year, the CM Russell Museum hosts a world-class auction of art, during Western Art Week that takes place every March to commemorate Russell’s birthday. It has become one of the leading Western art auctions in the United States. The Russell draws collectors and Western art enthusiasts from across the globe. In the art world, the name Charles Marion Russell, America’s Cowboy Artist, is synonymous with vibrant, distinct Western art, conservation of land and wildlife, and advocacy for American Indian cultures. His work continues to attract admirers and collectors alike, garnering the late artist well-deserved critical acclaim.